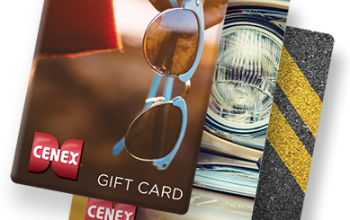 There’s nothing like a friendly Cenex® store to transform a long drive into an adventure. With more than 1,400 locations across 19 states in the U.S., it’s nice to know your favorite snacks, quality fuels and welcome smiles are just around the corner. Let Northern Lakes Cenex & Corner Deli take care of all your travel needs, whether going far or staying close to the beautiful northwoods area. The Corner Deli, located within Cenex, is a delicious full service deli with many items being Made-from-Scratch with the innovative ideas from many of our staff members! Subscribe to receive our weekly email with daily Soup & Sandwich Specials! Grab a Punch Card next time you pick-up lunch! The Corner Deli, located within Cenex, is a delicious full service deli with many items being Made-from-Scratch with the innovative ideas from many of our staff members! 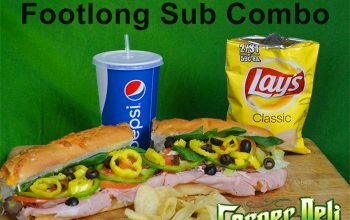 Subscribe to receive our weekly email with daily Soup & Sandwich Specials! Grab a Punch Card next time you pick-up lunch! Looking for that perfect gift? 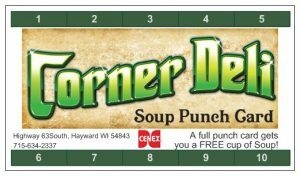 Give the gift of a Northern Lakes Cenex Car Wash Punch Card! 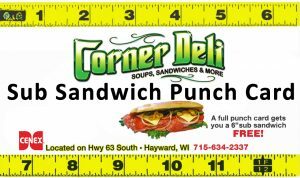 Corner Deli Weekly Specials sent to you! 3 easy steps: Click here to fill in the quick form open your inbox every Monday to plan your weekly lunches. Or dinners! Share with your kids, friends & co-workers! Not only does Northern Lakes Cenex provide Non-Ethanol gasoline, 24 hour pay-at-the-pump option, Clean & fast Car Wash, and Premium Cigars; but it also has the Corner Deli inside! The Corner Deli has many options for Breakfast, Lunch and Dinner on the go! Made-from-scratch soups available daily and check for the Sandwich of the Month! 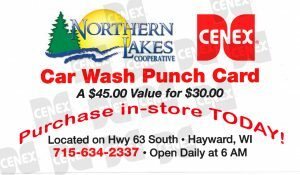 Give the gift of a Northern Lakes Cenex Car Wash Punch Card! Cenex® TOP TIER™ Detergent Gasoline maintains your vehicle automatically. With 2.5x more detergent than regular fuel, it maximizes performance and efficiency for a cleaner engine and fewer trips to the mechanic*, all from simply fueling up your tank. It’s just another way We’re With You®.